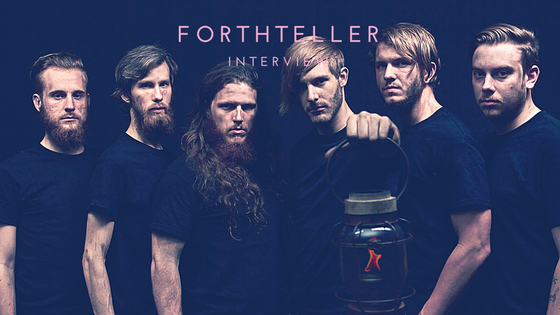 The latest album from Florida metalcore band Forthteller, Nihilist, dives into topics related to contemporary society, identity issues and human existence. It’s their most intense album to date, from the topics to the composition and lyrics. By writing such an intellectually sophisticated album, this gave them the opportunity to not only grow as musicians but start a chain reaction by opening up these types of conversations. What started out as a simple track-by-track analysis grew into so much more for drummer Thom Schultz. With the heavy content discussed in the EP, an analysis seemed like the best opportunity to introduce the topics to listeners. “I was trying to create avenues for people to connect and I wanted to do it in a way that added value to them,” he said. While working on the analyses, Schultz noticed that the comradery between the visual art community and the music community was not what it used to be. It inspired the band to create a concept that would bring back the visual element to music. Their attempt to bring the communities back together starts with their game changing merchandise project, Subverting Silence. The project brings together the depth behind each song with interpretations from hand-chosen artists who then have their work become Forthteller’s merchandise line. After sharing the lyrics and analyses with the artist, the artist then contribute a visual component that brings a whole new meaning to each track. “The thing about visual artists is that they see the world different… they’ll add depth and meaning and purpose to lyrics we already had that go beyond anything that we ever thought of,” Schultz said. Subverting Silence comes from two different viewpoints. It starts with undermining the status quo and relates back to the need of having music and art work together. The silent expression of art can be used to subvert the status quo. It comes full circle back to Nihilist and the theme of subverting society in the topics addressed on each track. By undoing the silence of these topics, it gets people talking. By purchasing a piece from the Subverting Silence line, it’s not just a contribution to the band and artist but it’s that chain reaction that Forthteller was looking to create. The piece of merchandise comes with an explanation behind the design, getting the conversation rolling on the topics at hand within the album. Nihilist is about looking to understand and get people talking about the lack of substance found in human existence in today’s society. Nihilist is about flushing out the ideas of identity issues that stem from the human existence. Subverting Silence brings those topics beyond the point of words and into the point of art. Subverting Silence is an ongoing effort to keep the conversation rolling. How will you do your part in keeping up the conversation?